The fact that I managed to get my blog posts done and up on time last week was a miracle in itself. The daughter was away for a conference followed by a mini vacation last week. This meant my part time babysitting hours were extended to full time - from 4 hours a day to 9 ½ hours a day. This didn’t leave a lot of time (or energy) for writing. I had some serious flashbacks to when my daughter was little and I was struggling to find my way as a writer, and found myself comparing then and now. I wrote a long, whiny blog post about it but in the course of writing realized it was like comparing apples to oranges. Maybe someday I’ll write that blog post, but don’t worry, this is not that day. Lest you think I was a total writing slacker last week, I did keep up my journal - both my personal one and my writing one - and I wrote a couple of poems which I finished up over the weekend. The excerpt I posted on Friday was from a story I came up with in high school, and in the course of looking for it I stumbled across several other potential stories from that era. I vaguely remember the first story I ever wrote in high school. It was science fiction (of course, because I thought I was going to be a writer of science fiction stories) and it had something to do with a group of people in cryo-stasis on a rocket ship. No idea where they were going or why, nothing of it remains (which is probably for the best). The first book in my Moonstone Chronicles series, Magical Misfire came from a story I started in high school. I’d written the first twelve chapters and then abandoned it because I had no clue what to do with my main character once I got her to the magical realm. Come to think about it... I’m pretty sure the original idea for my Elemental series came from something I wrote in high school. It just goes to show you that maybe your mother wasn’t crazy after all, saving all your old high school compositions. You never know what might spark an idea for a story. So. While I didn’t get much writing done last week, as I said in my Friday post I’d like to change that. I’m setting myself a daily goal of 250 words minimum - that’s like one double-spaced page - of fiction. 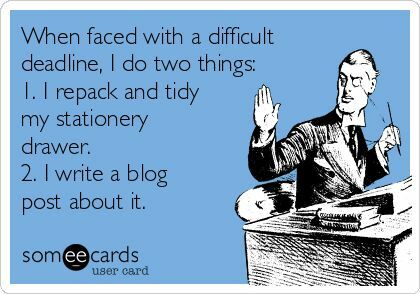 If I can’t manage at least that then it’s time to turn in my typewriter. Or lap top. Or whatever. You know what I mean. Once I’ve proven to myself I can be consistent with 250 words I’ll up it until I find a number I’m comfortable with. And then I’m going to start posting my proper wordage reports again. Wish me luck - I’m gonna need it!